Planning to join us on the Feature Friday Conference Call this Friday? Please sign-up in advance so we know how many folks to expect and can make any special arrangements that might be necessary. 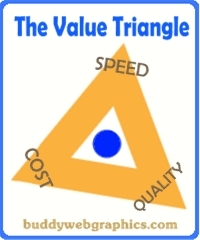 01 – Join “The Better Together Approach” group at Linkedin. 02 – Scroll through the Managers Choice Carousel at the top of the group page and open the “Feature Friday Sign-Up discussion. 03 – Click the discussion TITLE to open the discussion. 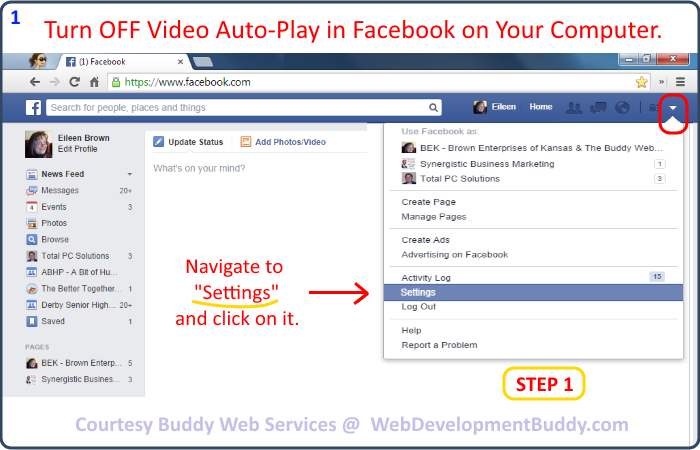 04 – Add a comment that includes your business information and contact information too. A link to your website or blog is welcome. Add a ‘referral request’; these are marching orders to other members to make a call or send an email to help you with contacts you need. 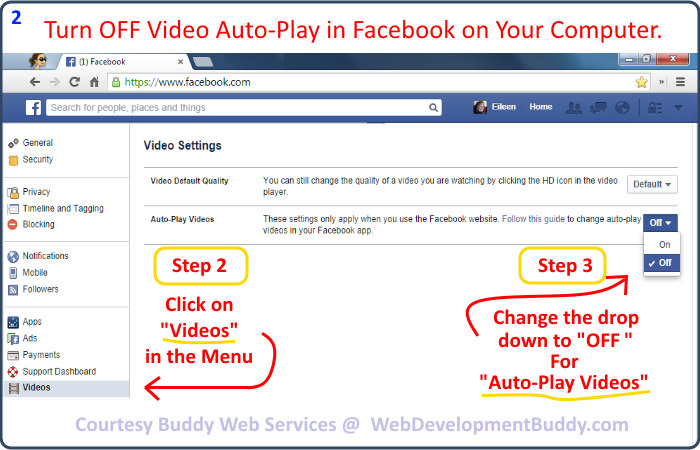 05 – Hit the ‘add comment’ key and you are all ready to join the Feature Friday Conference Call for the current week. 06 – Be sure to have a one minute speech ready to share on the call! Eileen Brown is the volunteer web consultant on the Feature Friday Conference Call and helps new and experienced business owners hone their online presence and overall technology skill sets. 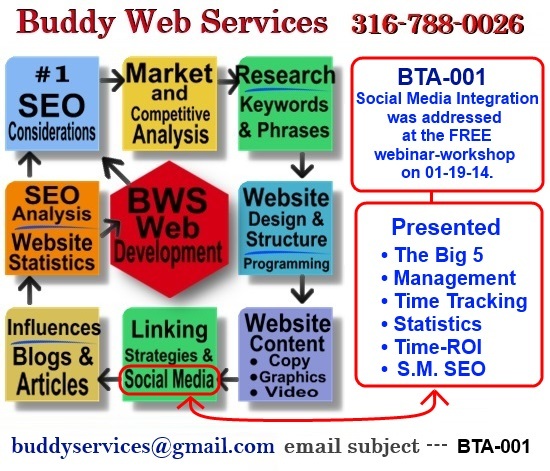 Contact Ms. Brown through this blog or her website for Buddy Web Services. The administrator of any Linkedin group has to have enabled promotions as a tab before you can post to that area. Be sure you know the rules for the group in question before posting a promotion. In this example the group used is “The Better Together Approach” and although not a new group it does have a new name, just today. The previous name was “Givers Gain.” Becoming active in this group is recommended as there are features found there that are not available in many other groups. Feature Friday – You introduce yourself on a conference call each and every Friday. Everyone gets to introduced themselves. A good way to spread info about your biz. You also have the option of adding your contact information in a post in the promotions tab if you attend the conference call. Free Webinars – As concerns many areas of “web development” that many small to medium businesses may be interested in attending. Sunday Afternoons. 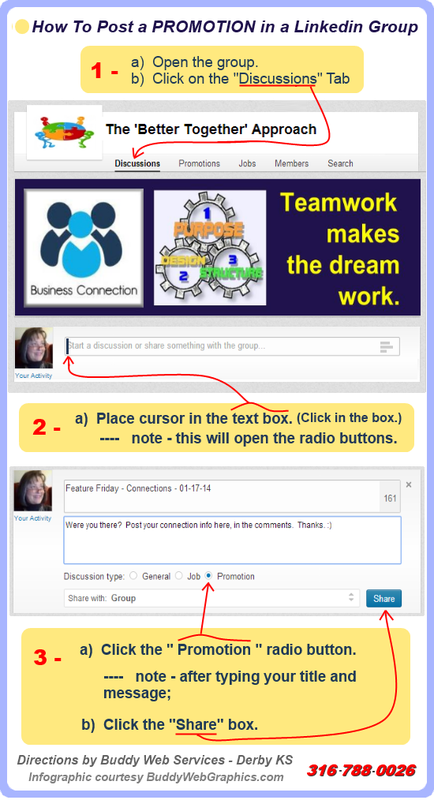 Same here – you have the option to ask your questions in the group and add your contact information in the Promotions Thread. Click on the “Discussions” tab. Click in the “text box” next to your picture or avitar. Enter your title and body text. Click the radio button for “Promotion”. Choose your share options (usually just Group). Chick the “Share” button to post to the Promotion tab. Web Development – What you need to know. Use the web development chart above to learn the basics of what needs to be done to obtain optimal SEO (search engine optimization) for your business online. Marketing on the web is not as complicated as many people seem to think. However, just seeing the basics does not explain what all the steps are in each category. There is much more to know about web development then just eye candy. Join Lamar Morgan at the “The ‘Better Together’ Approach” network for business at Linkedin to get an overview of how to go about your own web development or to be able to hire a consultant to help you achieve your biz goals on the World Wide Web. Join me as Lamar introduces me to the group on a Feature Friday Tele-conference call – ask Lamar in the group to send you an invitation for my introduction next Friday, January 17, 2014 at Eastern time of 7:45 AM. Webinar to follow on Sunday January 19 at 4:00 PM Eastern Time.